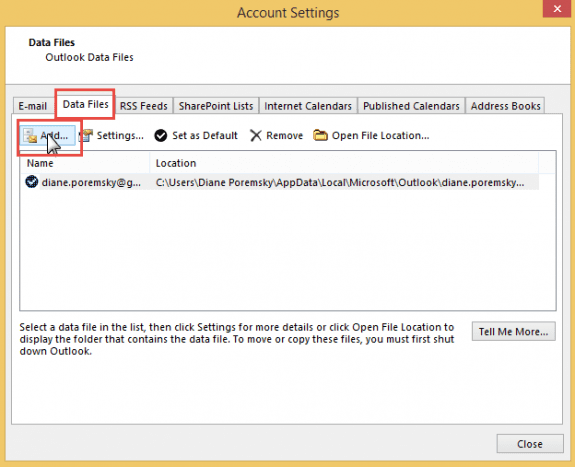 Beginning with Outlook 2013, there are changes in how IMAP accounts are handled. 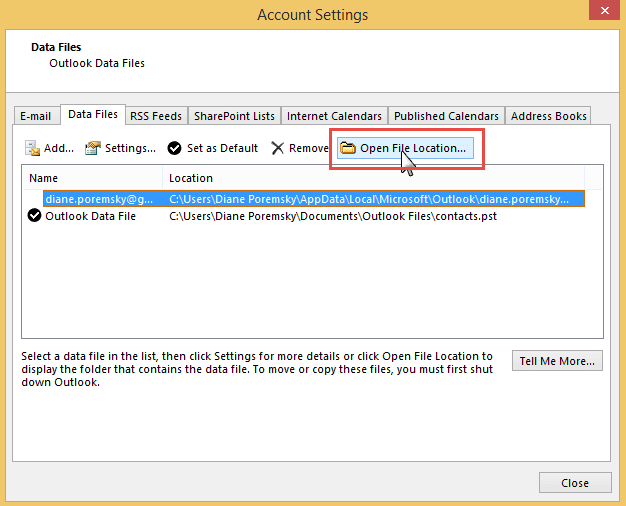 Instead of using two data files, one for IMAP email and one for your calendar and contacts, Outlook 2013 uses an .ost file for IMAP accounts and stores appointments, tasks, contacts, and notes in the IMAP data file, in folders labeled "(This computer only)". While users with just one email account in their profile may like having only one data file, it's really not in most user's best interest to use the IMAP .ost file for calendars and contacts. This is problematic for a number of reasons, including the fact that you can't move an IMAP .ost file to another computer or profile. You need to export the contents of the non-mail folders to a .pst file to move them to a new computer (or a new profile). You can't backup the .ost and easily recover the appointments and contacts from it. You need to export the folders on a regular basis to back them up. In addition to the issues involving backing up or moving your calendars and contacts, you also won't be able to set a range of flags and reminders or use Categories on the items stored in the IMAP .ost file. The solution? Use a .pst file for your calendar and contacts. If you have a POP3 account in your profile, set it as default and move your calendar and contacts to the folders in the pst file. You can remove the (This computer only) folders by closing Outlook, deleting the IMAP .ost file then reopening Outlook. It will create a new .ost file without the special Outlook folders. Follow the steps in Section A if you need to create a pst folder. Repeat the steps above for Contacts, Tasks, and Notes if you have contents in those folders. If you select the IMAP data file in the Account Settings, Data File dialog, then click Open File Location, Windows Explorer will open to the location where the folder is. Close the dialog and Outlook then delete the IMAP ost file from Windows Explorer. After adding the pst file for calendar and contacts, you may want to rearrange the navigation pane, putting the IMAP account at the top and the Calendar & Contacts pst at the bottom. I also recommend choosing a different start up folder if Outlook starts in the pst file's Inbox. Make this change in File, Options, Advanced. The option to choose a start up folder is near the top of the screen. Hi. I'm confused. In Step B it says Select All and move or drag the appointments to the new calendar folder. How do I do that? And at the end, don't I want to make the data file with the email in it the default? That assumes you have events on the 'this computer only' calendar and want to move them to a local pst. If you make the datafile with the email in it - which is an imap ost - if its set as default, the 'this computer only' folders for calendar & contacts will be used. Diane, thank you for addressing IMAP accounts (Comcast email) and Outlook 2016 on my laptop. It was very helpful. I created a PST of Calendar & Contact items from my OST file, but I did not delete and restore my OST file because I have extensive email Folders and Sub-Folders that I can’t risk losing. Going this route meant I had to remove some “Duplicate Calendar Popup“ items and consolidate many of my special contact folders, but it was worth the effort. Thank you! There is no way I would have ever figured this out on my own. This issue has been bugging me for the longest time. Thank you! You are THE authority on Outlook. With the new way Outlook 2016 handles IMAP accounts and stores contacts and calendar data, it looks like I'll not be able to synch my iPhone to contain mail, contacts and calendars as before with MS Office 2010. With Outlook 2016 I've ended up with three sets of calendars and contacts (One file each for "This Computer Only," my email data file and an Outlook Data File) and no good way to merge them to have them automatically update and be available for an iPhone/iTunes synch. Won't I have to regularly keep merging my calendar and contacts among three files manually to maintain a single set of contacts and a calendar? I can't imagine how few MS Office/iPhone customers could manage to set this up and still not be able to use and synch the features they need. These changes must be for marketing/business reasons only as they doesn't seem to benefit the users. Is my only option to go back to Outlook 2010 to do this? How did you do it before? You either need to use outlook.com/exchange accounts or iCloud addin. If you use the iCloud addin, It will move the 'this computer only' folders to the imap account's trash folder. Or set a pst or exchange account as default data file and get rid of the 'this computer only' folders. No outlook.com/exchange: you need to use iCloud addin or a 3rd party utility such as companion link (or gsyncit, if using a gmail account). Thank you! Thank you! THANK YOU!!!!!!!! The .ost files all reappeared in the Explorer folder...\Microsoft\Outlook\..., with all their data(! ); but not the Outlook folders '(This computer only)'. Is that normal? The 'this computer only' folders are only created if you set the imap data file as the default data file, so yes, it is correct. Brilliant! Many thanks. I am now on my way to understanding and consolidating Outlook 365 Calendars and Contacts. Who knows? I may even find out how to synchronize Outlook 365 data with the Outlook app on my phone, without using Google as an intermediary.